For most of our trip, we'd experienced good weather. We had a little rain in Japan, and it was really cold in South Korea (but that'll happen when you visit Seoul in December), and our last day in Romania left us a little damp, but overall, the weather on our trip had been pretty agreeable. But we blew into Rome along with a good-sized thunderstorm that drenched the city nonstop for our first two days. The first day was a travel day so it wasn't that big of a deal. 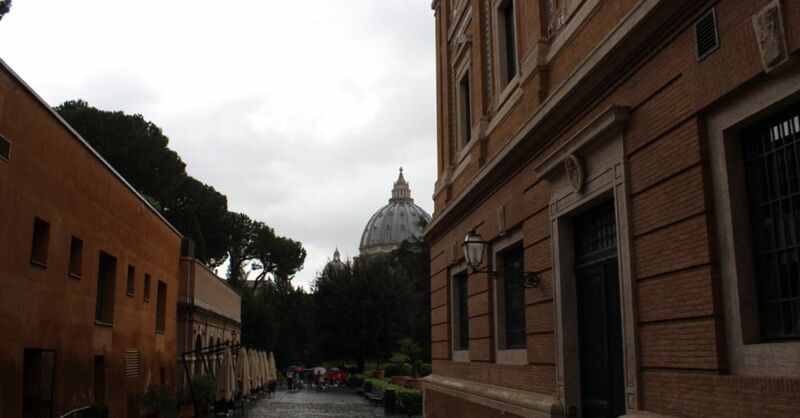 But the next day we had tickets to the Vatican Museum, and that required a walk in the rain. Vatican City is, in addition to being a city, a really small, landlocked country tucked inside another country. So, technically, the first thing we did after arriving in Rome was to leave the country. But despite it being in a separate country, it is, along with much of central Rome, considered a UNESCO World Heritage Site (under the cumbersome name of Historic Centre of Rome, the Properties of the Holy See in that City Enjoying Extraterritorial Rights and San Paolo Fuori le Mura—seriously). There were two things we wanted to see in Vatican City. 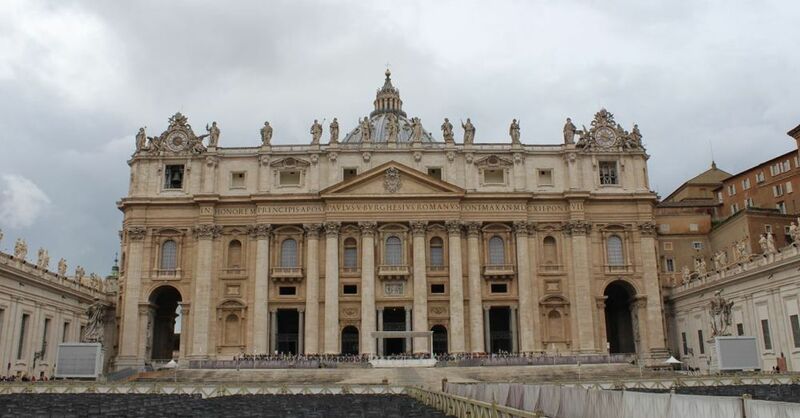 One was the Vatican Museum (which houses the Sistine Chapel) and the other was St. Peter's Basilica. Entrance to the Basilica is free, but tickets to the Vatican Museum cost us €53 (€5 of which was for Jackie's audio guide—the girl does love her audio guides). Waiting for Vatican Museum tickets in the rain. We paid for our tickets to the Vatican Museum in advance (we buy advance tickets whenever possible). This did two things for us. First, we got to skip the long queue to buy tickets (which was a good thing in light of the near biblical rain) and we got to quickly shut down all the touts hawking tickets on the streets outside Vatican City. The hardest part of getting inside was figuring out which line we needed to be in (which wasn't all that hard), we entered, went through security, picked up our tickets from the and off we went in to see the art. And let me tell you ... the Vatican Museum has a lot of art. Probably the biggest surprise we had was just how many Egyptian artifacts are in the Vatican—at least five rooms' worth of artifacts, statues, statuettes, papyruses, stone fragments with hieroglyphics, and yes, mummies. There are three mummies on display, which is about three more than we'd ever seen in any museum before. As you might expect from a museum in the heart of Rome, there are also a lot of statues in the Vatican Museum. 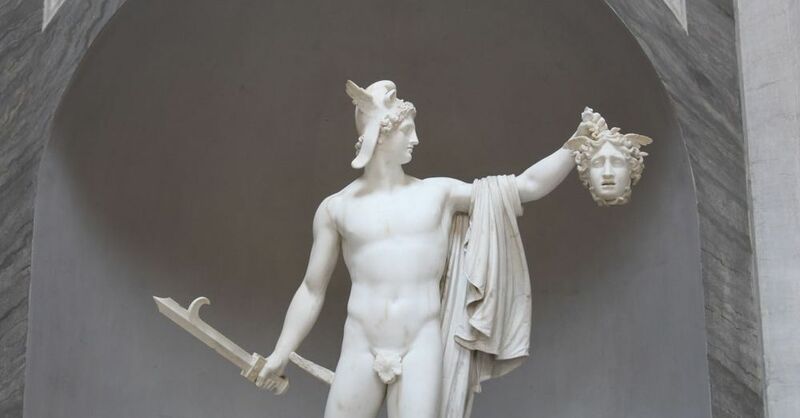 When going to kill the Medusa, don't forget to wear your fig leaf. Many of the statues were depictions of stories from Greek and Roman mythology or busts and full figures of former Roman emperors. But there was one room (the Sala degli Animali) which was filled with statues of all sorts of, you guessed it, sculptures animals. Most of the statues were of marble, but a few were made from different materials—most notably the gilded bronze Hercules from the Theatre of Pompey, now housed in the Sala Rotunda. There was even a long, long hallway (called, I think, the Hall of Busts) filled with countless marble heads (mostly) of all sorts of people. Some were famous, but many were just labelled as "Male Face" or "Female Face" if they were even labelled at all. There were many busts of young children and babies in this hall, too. During a brief moment when the rain stopped, we ventured into the Pigna Courtyard (Cortile della Pigna, so named for a giant pine cone that used to be a fountain). The centerpiece of this courtyard is one of the Sfera con Sfera sculptures (there are many of these in different museums around the world) that rotates around every so often. Before we started the walk to the Sistine Chapel, we had to get a little food. We settled for the pizza place in the basement of the Vatican Museums. Let me tell you this—do whatever you can to not eat here. The reason most people visit the Vatican Museums is to see the Sistine Chapel, famously painted by Michelangelo from 1508-1514. But there's a great many halls one must walk through before you even get to the Sistine Chapel. Vatican Parking Lot (better known as the Belvedere Courtyard/Cortile del Belvedere). Getting through these halls can be challenging. They are jammed with people, and many of those are in large tourist groups, which stop in the middle of the halls to listen to the tour guide point out some notable feature. This causes and a lot of jostling, pushing, and shoving as the other visitors try to get by a large group spread across the hall. And when two competing tour groups meet, confrontations can get a little heated. Of the many halls we traversed, our favorite was the Map Gallery, which is a really long room lined with large painted maps of cities, towns, and different regions of Italy. The left side was being restored, so we didn't get to see all the maps, though. We also walked through the Sala Sobieski, the Hall of the Immaculate Conception, Raphel's Rooms (showcasing art by Renaissance painter Raphael), Borgia Apartments, Pope Pius V's Chapel, and the entire 20-some rooms of the Vatican's Museum of Modern Art before we arrived at the entrance to the Sistine Chapel. There's no photography or video allowed inside the Sistine Chapel. But that didn't stop people from sneaking shots of the ceiling from cameras held at waist-height or taking selfies with camera phones so that all you see is a big head-shaped shadow in front of The Creation of Adam. I'm sure both options will provide people with memorable keepsakes. There's also no talking in the Sistine Chapel. But anytime you cram that many people into a room, even one as large as the chapel, it's going to be noisy. So the guards spent a lot of time saying, "Shhhhhhh!" with much insistence as people gasp with excitement as they filed into the room. This is not the Sistine Chapel ceiling. But you get the idea. 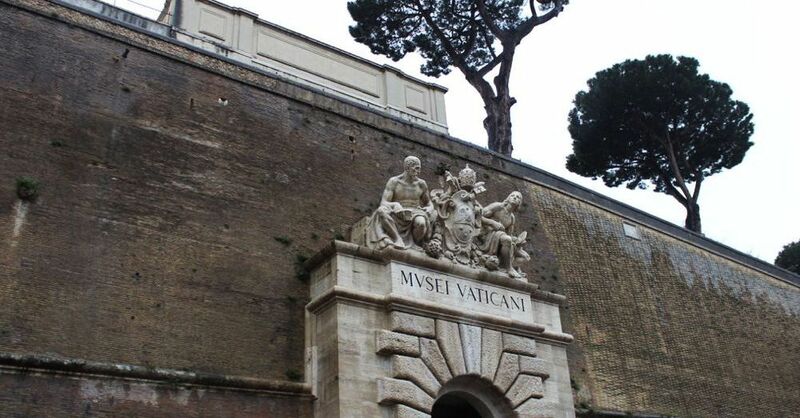 After we finished looking at the ceiling, we shuffled out of the chapel and walked back out down a long hallway lined with still more artwork and displays, most of these pertaining to the Papacy proper. We also noticed groups of people heading toward the Sistine Chapel. Only too late did we realize that there is a way to see the Sistine Chapel without walking through all the other halls. We spent about four hours inside the Vatican Museums. We were a little tired, but as long as we were close, we wanted to check out St. Peter's Basilica. St. Peter's Basilica from the Vatican Museum. The Basilica is a short distance from the Museum (who am I kidding—everything in Vatican City is a short distance from everything else. You can see the Basilica from the Museum, but, alas, you can't get to it from inside the Museum's borders, so we walked to the exit and left down the spiral staircase. Exit the Vatican Museum via this awesome spiral staircase. After we left the museum, we then left Vatican City, entered Italy again, then walked halfway around the small city-state, and then re-entered Vatican City on the other side at St. Peter's Square. 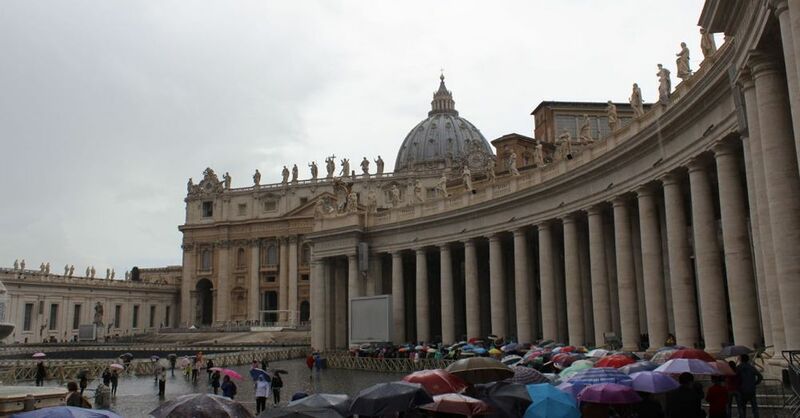 The line for St. Peter's Basilica is long, even in the rain. We were visiting on Tuesday, and the place was getting ready for Papal Audience, scheduled for the next day (the Pope holds such an audience every Wednesday if he's in the country), so chairs were set up all across St. Peter's Square. We walked around briefly, snapped some photos, then headed back to the hotel. We'd managed without umbrellas for this long, but since we had a car (meaning we didn't have to lug them through airports) and we were pretty wet, we decided to pick up a pair of umbrellas (only €5 each!) along the way. That night, Samantha went to take an Italian cooking class while the girls and I walked around a rain-soaked Rome for hours in search of the final piece of their mother's birthday present. We were marginally successful. 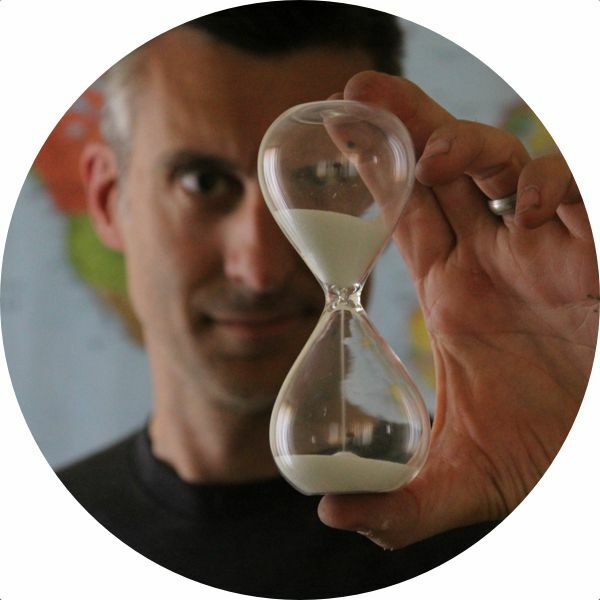 Tom Fassbender is a writer of things with a strong adventurous streak. He also drinks coffee. Read more of Tom's posts.